The season are already over the half way and approaching the decisive moments. 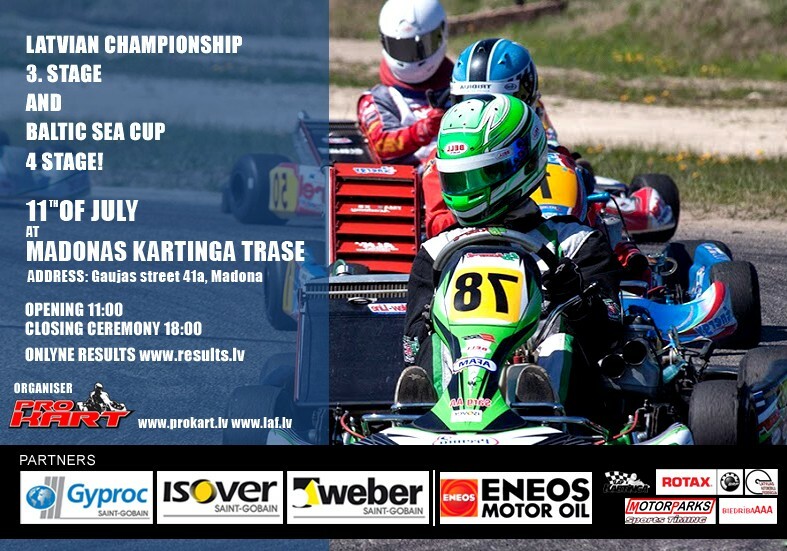 This weekend in Madona will be played out the third Latvian championship and fourth Baltic Cup stage. For the Race have registered drivers from all over the Baltics as well from Russia, Belarus, Finland and Ukraine. The total number of currently signed up participants is 76, who will compete in six different karting groups. The event begins with a free practices on Thursday and Friday. The Race official opening ceremony on Saturday at 11:00. Info for participants. There are met agreement with the Latvian oil fuel distributors whose network is “Ziemelu Nafta”gas stations. From these competitions, the official refueling place becomes Latvian Oil gas stations. Each participant will receive a gas discount card. Discount are 3 Euro cents. Incidentally, these discount cards can also be used in everyday life. Thursday from 15:00 Madona track will be able to get these discount cards at the race organizer's representative. In the meantime in Karting Commission meeting were adopted fuel control rules that are binding in these competitions. In short words it is, after the finish in the fuel tank must remain at least one liter of fuel for analyzes. The samples if necessary through company Latvian Oil will be sent to the laboratory for further controls. As well the fuel for the race must be purchased either on Friday or Saturday. The rules in full can be found here (Latvian). Ideally, of course, is not to cheat with fuel, and no one will be engage in unnecessary fights for justice. All through the competition-related provisions can be found under the Tag "Regulations" and "Races", and also under www.laf.lv. A personal transponder is considered as an advantage, of course, it is possible to rent it for the race, but it increases the competition participation fee. All race results to be found online here www.results.lv. Good luck and see You on race track.